Looking for a pre-owned Toyota vehicle? Then you’ve come to the right place. Check out our pre-owned inventory at St. Cloud Toyota below. We know that sometimes buying a new 2019 Toyota Camry or 2019 Toyota Tacoma isn’t always feasible. Luckily, Toyota vehicles retain their value for years, so you know you’ll be driving off in a reliable car. Plus, if you ever need service or repair, our Toyota service center near St. Cloud, MN can address any issue that comes up down the road. For extra savings, be sure to check out our used Toyota specials, as well. We hope to see you soon! 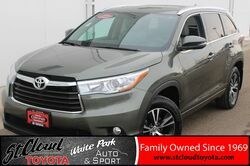 Pre-owned Toyota vehicles retain their value like no other brand, making them a smart investment for Waite Park, MN customers who want a vehicle to drive for years to come. But if you want a pre-owned vehicle with even more guarantees and protections, we encourage you to check out the certified pre-owned vehicles above. All of our CPO Toyota vehicles at St. Cloud Toyota undergo a rigorous mechanical inspection to ensure they meet the manufacturer’s standards. You don’t need to buy a new 2019 Toyota Highlander in order to get a great Toyota vehicle. Worried about maintenance or repairs down the road? If that happens, the expert technicians at our Toyota service center in Waite Park, MN will address the problem and get your car back on the road in no time. We look forward to seeing you soon!